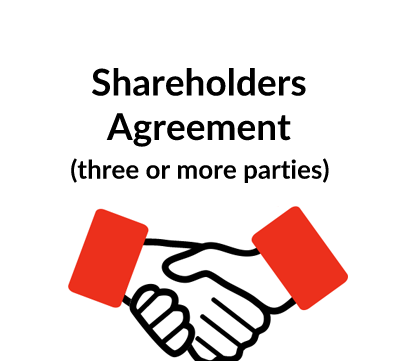 This is a three party agreement, suitable for three individuals proposing to set up a new company in which each of them will be a shareholder and a director. You need this document if you’re looking to ensure clarity and safeguard the interests of shareholders. 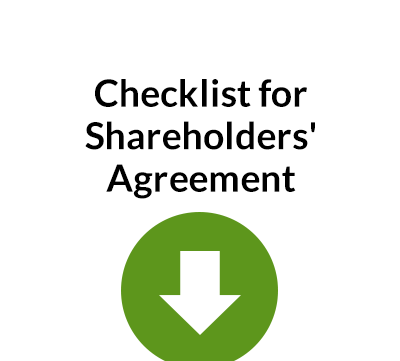 Also see our Checklist for Shareholders Agreement. For a two party shareholders’ agreement template, see Document A107. 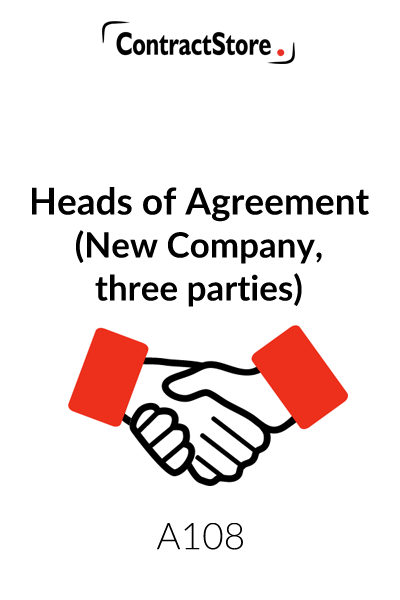 These Heads of Agreement provide a model form of preliminary agreement between three individuals wishing to set up a new company in which each of them will participate. 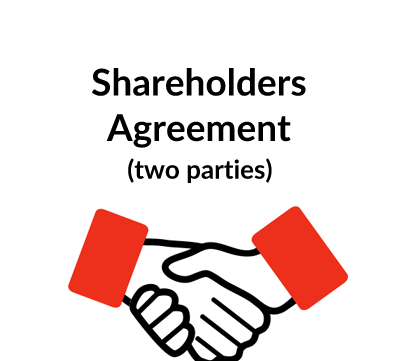 The Heads of Agreement assume that a formal Shareholders Agreement will be entered into but until that happens, the Heads of Agreement will have contractual effect. The Heads of Agreement, being in a summary form, will cover only the key issues which the parties agree at the beginning of their relationship. Set out below are some notes to assist anyone using this model form. Here the full name and address of each of the parties should be set out. The nature of the business should be spelled out here. The Heads of Agreement assume that a limited company will be incorporated and that at the time of signing the Heads of Agreement there is no certainty that the preferred company name is available for registration. The country of incorporation and the name of the Company are to be inserted here. Here the initial share capital and the percentage holding of each of the shareholders will be set out and their commitment to the initial cash which is required. Legal and accounting advice should be taken to establish how much the initial capital should be, based on the business plan, and whether this should all be in shares or in a mixture of shares and loans from shareholders to the company. This paragraph addresses the question as to whether the shareholders may be required to contribute extra capital and if so, whether the proportions are to be the same as the initial capital – usually this is the case. Bank borrowing is also catered for here as a possible way of dealing with working capital requirements. This paragraph makes it clear that the objective is to maximise profits and to distribute them by way of dividends. Such a policy might not always be the case – e.g. if the parties wish to build a company up in the early years, ploughing back as much of the profits as they can into the business. There may also be tax implications to be taken into account and tax advice should be taken from accountants. With a joint venture project, it is, clearly, important to establish who the first directors will be and what their voting rights will be. Paragraph 9, requiring unanimity for certain major decision, is also relevant. Where the capital or other contributions of the parties to the new venture are unequal – e.g. if one person is contributing 60% and the others are contributing 20% each, the majority participant may want to have greater control than this paragraph would allow – e.g. by providing that any two votes, including his own, would be required to pass a resolution. This paragraph will set out any particular obligations of the various parties. For example, one of them may be appointed to manage the business while another might provide office premises or particular services to the company. It is quite common for key decisions to require the unanimous vote of all the shareholders or directors. One problem which may arise is what happens if unanimity cannot be achieved. The Shareholders Agreement should deal with this by providing for deadlock provisions which are mentioned below. A deadlock is never an easy matter to resolve and could ultimately result in the Company being wound up. This paragraph provides not only for the opening of an account with a named bank but also who will be able to operate the account. A company in the UK will usually need accountants to prepare its annual accounts and deal with tax returns etc. Auditors are only needed if the turnover is more than £5.6 million or gross assets exceed £2.8 million. It is sensible to nominate the accountants early on, although this paragraph is not essential when the company has not yet been formed. Although the parties to a new venture may not be expecting a disagreement, it is advisable to provide for this in any formal documentation. Deadlock provisions provide a possible route out of a difficult situation and need to be carefully drafted by lawyers. Although not necessary, it does no harm to make it clear that the parties will act in good faith towards each other. As for non-competition, whether or not such a provision is appropriate will depend on the nature of the business and the interests of the various parties. Depending upon the nature of the business it may be desirable to provide that the parties agree to devote sufficient time to the running of the Company. Since the Heads of Agreement do not provide a complete document, the sooner the Shareholders Agreement is prepared and agreed the better. Lawyers may be needed for a formal agreement but ContractStore has a number of templates that can be used – just type Shareholders Agreement in the search box on our website. The third paragraph makes it clear that the Heads of Agreement have contractual effect. 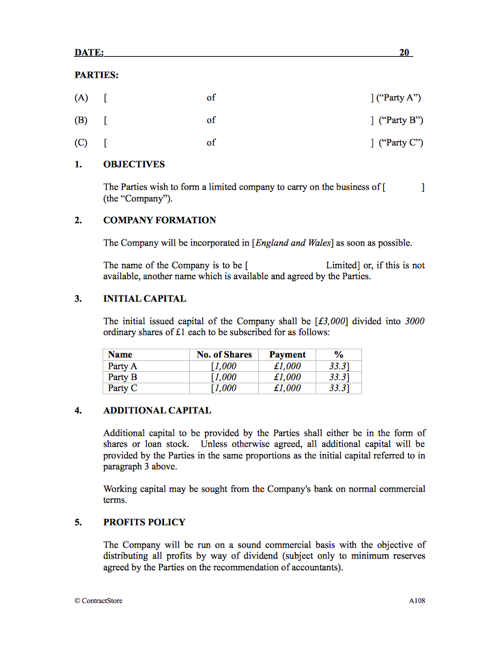 If the parties want the Heads of Agreement to have only a limited life, a provision might be added that if no Shareholders Agreement is entered into within a specified period, the Heads of Agreement will cease to have any effect and no party will have any further liability to the other: suggested wording is set out in square brackets. This is not an essential provision if all the parties and the company are in the same country and there is no foreign element to the arrangements. But it does specify which is the governing law and what is the method is for resolving disputes – here it is a reference to the English courts. There is free information on our website concerning governing law, jurisdiction and resolution of disputes.